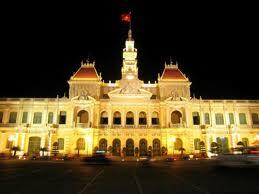 8.30, departs to Tay Ninh, 100km north of Saigon. Visit the Cao Dai Holy See for the daily noontide ceremony with hundreds of worshippers attired in lively red, yellow, blue and white and chanting religious hymns. Attend the colorful mass at noon before lunch in a local restaurant and then continue to Cu Chi tunnels, famed for its 200-kilometre-long tunnels, an incredible underground network built by Vietcong during the Vietnam war. Back to hotel in the afternoon. Take an morning flight from Dalat to HCM. Driver and guide transfer you to Ben Tre where we take a boat trip on the Mekong River to Coconut Islet. Enjoy a brief walk on the islet, trying native fruits and viewing local handicraft production. Continue by boat to Tan Thach Commune to visit a family-run enterprise making coconut candy. Take a horse-drawn cart to Quoi Son to visit a bee farm and to enjoy tea & candies. After lunch with sample the local delicacy, Elephant\’s Ear Fish. Return by boat to My Tho, where our vehicle is waiting for transfer to Can Tho for overnight. Today, you will get up very early to catch amazing scene of Cai Rang Floating Market. During market hours (from 4am to 8am), larger sized boats anchor and create lanes that smaller boats weave in and out of. The waterway becomes a maze of hundreds of boats packed with mango, bananas, papaya, pineapple, and even smuggled goods like cigarettes. Reach the Cai Rang floating market, you will take for nice pictures or contact with local people. After the market, the trip will take you along the river bank and down cannels to see how people live. After that, visit at Can Tho local market, around the garden, do something as famers really do, fishing, rice working, plugging part in activities with the family, talking to local people about traditional lifestyle in Mekong Delta and visit Khmer monastery before transfer back to HCM. Check in hotel and free for rest of the day. Unlike other towns in Vietnam where you often drive from one to another venue to choose different favorite goods, lots of typical oriental products can be collected in Saigon downtown. So today is your own day to shop around. You will have time for shopping until transfer to airport for your departure flight. Meals as stated in the itinerary (B: Breakfast/ L: Lunch/ D: Dinner) with 1 soft drink included in each meal.